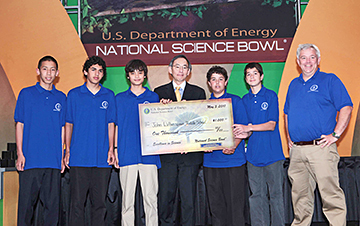 RADIANT ENERGY: Cabinet Member and Secretary of Energy Steven Chu presents a $1,000 check to John Witherspoon Middle School for fielding one of eight teams to advance in the Department of Energys 2010 National Science Bowl competition in Washington D.C., placing fourth overall. Pictured here (from left) are: Alex Jin, Sabar Dasgupta, Jeremy Peterson, Secretary Chu, Rye Anderson, Enric Boix, and Coach and Princeton High School Science teacher Timothy Anderson. The property tax revaluation in Princeton Borough and Township stands to affect all households, with homes being assessed at new values, which in turn directly impacts the share of the municipal, county, and school tax rate for which each homeowner is responsible. The New Jersey State Department of Transportation (DOT) recently rejected the Boroughs request to extend Sunday metered time limits and to reduce the limit on certain meters to 30 minutes along Nassau Street. At last weeks Board of Education meeting, Rebecca Cox and Tim Quinn were unanimously elected as Board president and vice president, respectively. Perennial plants with whimsical common names like purple lovegrass, little bluestem, and turtlehead were among those that provoked debate between neighbors, Borough elected officials, and staff at last weeks Council meeting. Ive attended many mini-reunions, and can vouch for the fact that this one was unprecedented, said Richard Miller in a letter to Princeton Alumni Weekly editor Marilyn H. Marks. This is the best exhibit Ive seen in this gallery, enthused a recent visitor in the guest book for How You See Me, the current exhibit, running through June 25, in the Bernstein Gallery at Princeton Universitys Woodrow Wilson School of Public and International Affairs. Neil Karandikar didnt allow himself to celebrate much after he won the boys first singles title last Friday in the Mercer County Tournament. For 40 years, this not-for-profit natural foods store has offered food the way it is supposed to be  organically grown, environmentally safe, and nutritionally sound.